Yesterday (October 3rd) we headed east by bus to Smith Falls (one of the major towns on the canal) to tour the canal museum there. In an old mill building the museum was a simple introduction, but nothing new to me since I had done much preparation into the history and building of the canal. Looking up the abandoned combined three locks. Wisely saved when the new lock was built. There was plenty of time there so I ran out and took a short walk to see the abandoned three combined locks (now a water garden) and the adjoining replacement single automated lock. What is so fascinating about the Rideau Waterway/Canal is that it is essentially as it was when completed in 1832 – a 175 plus living history working museum which became a UNESCO World Heritage Site in 2007. 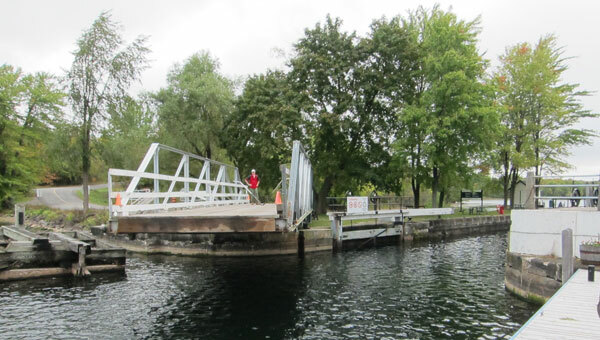 Of the 202 kilometers it covers connecting Ottawa with Kingston on Lake Ontario only 16.2 kilometers were actually cut where necessary to connect the lakes and rivers, usually with locks to circumvent falls and rapids. 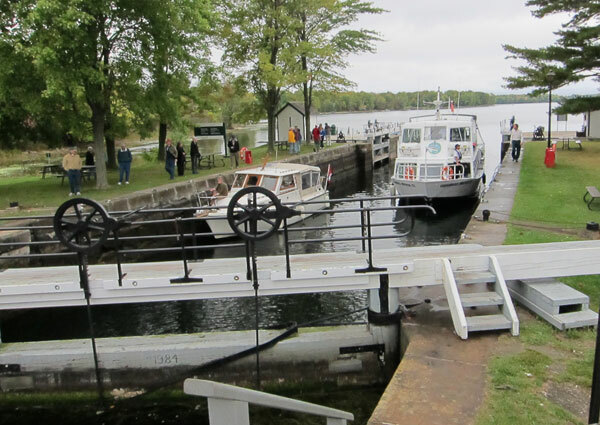 The locks go up from Ottawa to Upper Rideau Lake summit (the highest elevation of the waterway) at which point the locks step the waterway back down to Lake Ontario – fascinating. 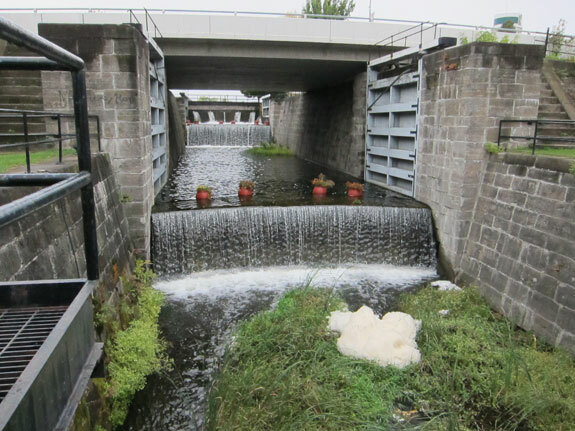 We then bussed a short distance in town to Park Canada’s maintenance yard for the canal. Our group guide is a retired Park Canada employee who spent maybe 20 years associated with the canal, and she had arranged a visit to the Gate Shop where the gates for the locks are made – a place no one gets to see. Up until maybe the 1960s gates were still made on site but now are made in this one facility. Looking in at the Gate Show showing a set just finished. Never seen sight. 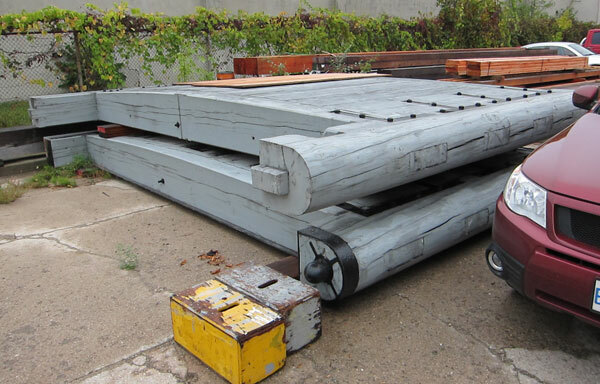 Pair of gates ready to be installed. Note curvature for deflection of water, and pivot pin at base of gate. without need for improvement. One last detail I learned later. The wood in the gates is deteriorating faster now also because the rings in the wood are larger. The trees are growing faster and healthier (possibly from specialized tree farming to maximize profits), and since there is less compression within the wood the interior spaces are quicker to rot. Alright, one additional unrelated “fast fact” – how do you survey in a thick and dense and thus dark virgin forest when you cannot see 10 to 15 paces in front of you? You survey at night sending your assistance out holding candles to shoot your survey lines to! Today, Tuesday I think, we bussed to Poonamalie Lock just this side of Smith Falls to tour back towards the Hotel, but stopping at Chaffey’s Locks where we will begin the second day of our trip. We first passed through the Narrows Lock Number 35 where we got off before our boat locked through. The young lockmaster was passionate about his work and shared so much about the various operations as I will show below. We later transited the Newboro lock before tying up for the day at Chaffeys Lock. Such fun, and the journey continues tomorrow. Entering the Narrows Lock. Our boat is the large one on the right. Note walkway on top of lock. Not a problem crossing them - OSHA would never allow in the states!!! 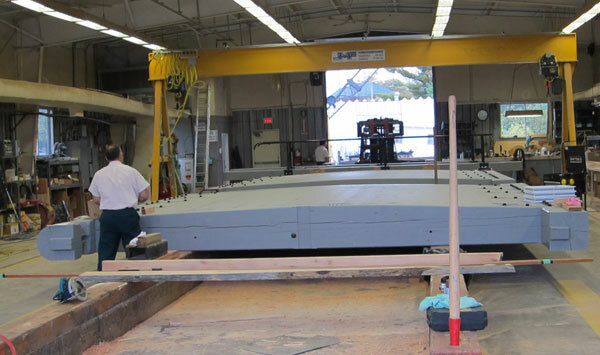 Swing Bridge for the roadway. Something else you don't see. The bridges are so well balanced that the young man gave a slight push on the lever and the bridge started moving by itself. Counter balanced perfectly except for the couple times semi-trucks (not allowed on the road) thought they could cross but caused major damage instead. 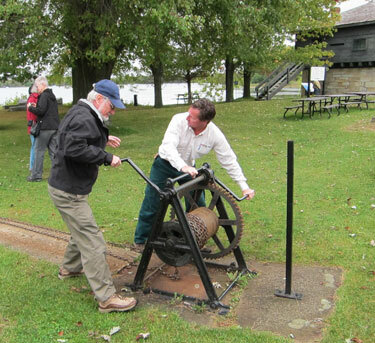 Young lockmaster (right) even let some of us help open the gates using the original "crab" winch and chains. Only the slightest effort is needed. Note lockmaster blockhouse in rear. More about the blockhouses coming. And at the end of today's journey was the late 19th century resort The Opincon. 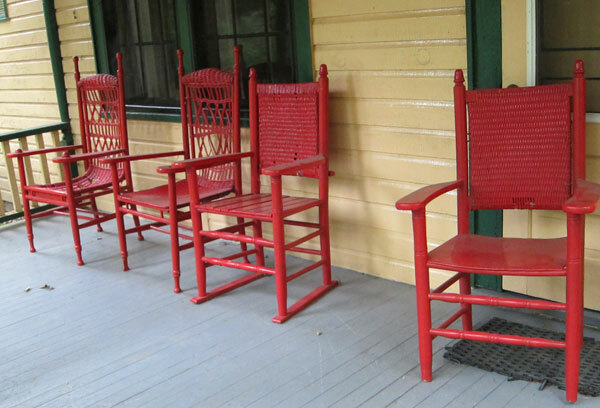 Not much changed from the 1890's and reminding me of the old summer resort experiences that have spurned my "shunpiking." An easy comfortable afternoon, an easy retirement! This entry was posted in 2011-d - Rideau Canal - (Oct) and tagged blacksmith, canal history, Rideau Canal. Bookmark the permalink. Great trip Ray, I don’t have to hope you’re having a good, I’m reading it. Nellie Ann and Cricket say hi and don’t worry about us, we are being very well fed, watered and litter fresh. Thanks so much for leaving us in such good hands, meow, meow. Looks like another amazing and educational trip supplemented by your curious personality and thirst for knowledge. Keep em’ coming Ray. Extremely interesting Ray. Why don’t they go back to the oak for making the new gates? Longer and better life of the gates and local, no shipping of inferior product. 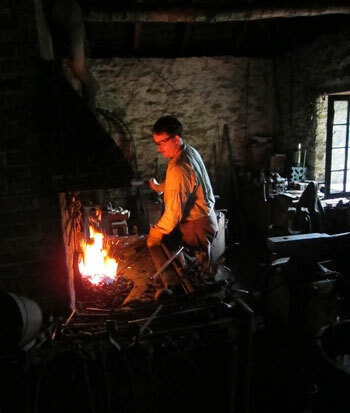 Poor blacksmith has to work in the dark all the time. Wow..this is a truly enlightening voyage. Keep trucking….